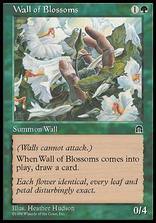 Wall of Blossoms ($1.34) Price History from major stores - Stronghold - MTGPrice.com Values for Ebay, Amazon and hobby stores! Card Text: Defender (This creature can't attack.) When Wall of Blossoms enters the battlefield, draw a card. Flavor Text: Each flower identical, every leaf and petal disturbingly exact.